Happy Wednesday! Welcome to midweek. I have two full days of plans for this weekend that include some house guests. So today’s Helpful Hump-day Hints (HHHs) are about what I am doing to get ahead so I can be ready for our weekend of activities and fun! I’ve got three evenings after work left before the weekend. 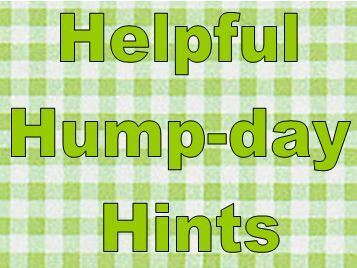 HHH#1 – Wednesday light – sort mail that has piled up, light dusting, laundry (including bathing suits and beach towels), pick up any groceries needed for the weekend, Google directions and plan out driving routes. HHH#2 – Thursday night – clean guest bathroom, fill up gas tank in car, clean car and prep for upcoming day trip (including stocking backseat holders with books, games, extra tissues, and napkins), check weather reports to see if any plans need to be adjusted, go online print out maps of venues and read up on any special exhibits to plan the daily agendas, and buy admission tickets to all event venues – I don’t want to waste time standing in lines! HHH#3 – Friday night – prepare lunches, snacks, and backpack for day trips, put stroller in the trunk of car, plug up all electronic devices so they are all fully charged. We are excited to visit Sesame Place, The Philadelphia Arts Museum including Arts Splash and The Oval this weekend. I will take pics and report back on any great family friendly activities we discover! Have a great Wednesday and thanks for stopping by and reading. Arts Splash. I’ve been wanting to get there. And of course the Oval.